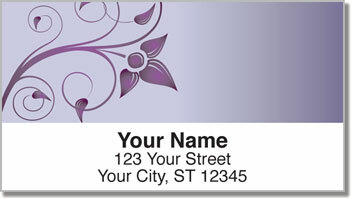 Here's a lovely design with a feminine touch that will look classy on your packages, envelopes and other items requiring your identification. We created these pretty Swirling Vine Address Labels and complementary Swirling Vine Personal Checks to lend an elegant, tasteful flair to your personal correspondence. Not only will these self-adhesive labels help you make quick work of preparing for a run to the post office, they're also very handy for marking books, DVDs and video games as belonging to you. Make these fabulous, feminine address labels yours right now!